Two part silicone and a bottle cap used to make a silicone mold for a dolls house scale pie crust. Photo copyright 2009 Lesley Shepherd, Licensed to About.com Inc.
Two part silicone mold putty is an easy to use, non toxic material for creating simple but detailed molds to produce numerous copies of many materials. It is the easiest, fastest means of producing a flexible, accurate, reusable mold which can be used to produce multiples of small items, including dollhouse miniature decorations and foods, repeatable parts (small trims and moldings) and items made from a range of materials (including foods like chocolate using the right mold putty). Silicone mold putty is a non pourable form of rtv silicon. 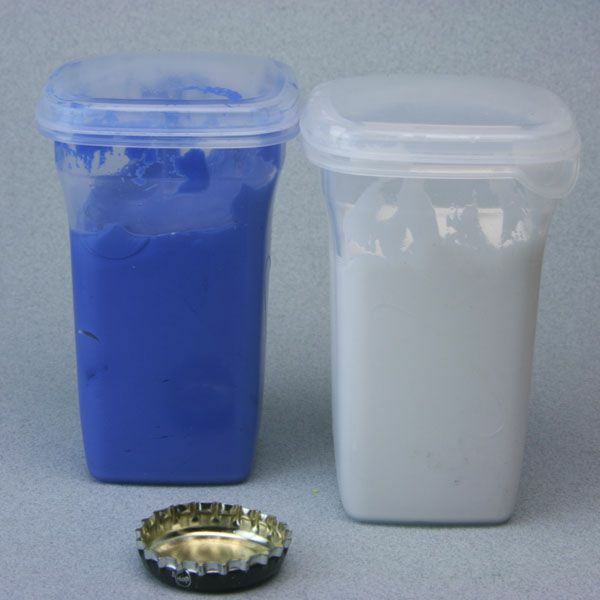 The two part putty form requires less skill and time, and does not require mold forms or containers which the pourable rtv silicone requires. Silicon mold putty is a two part hand mixed rtv silicone use to create flexible, reusable molds which will withstand temperatures up to 600 degrees Fahrenheit. Depending on the brand and it's strength, highly detailed molds are easily made for use with a number of materials including liquid / solid polymer clays, some metals, and two part epoxy resin. Some of these putties are food safe and may be used with chocolate or other foods. The material is firm when set and has limited use for molds where there are significant undercuts, or where a two part mold is required. It is most effective for simple press or one sided molds. Provided you are not allergic to silicones, silicone mold putty is safe for use and does not give off toxic fumes. If you intend to use it for a food purpose, make sure you obtain and use a food safe putty and use it only for food purposes. If stored in its original air tight packaging in cool, dark conditions, silicone mold putty will last for more than a year. It is important not to leave it exposed to air. All brands of this two part putty are mixed one part A to one part B by volume or weight using a simple kneading technique. There is no requirement for gloves to protect your hands. The two different materials are always colored differently, allowing the user to easily tell when the putties are fully mixed as there will be no streaks. It is best to complete the mixing in a minute or less. After mixing, the putty is immediately pressed around or against an object to create a tight fitting mold and left to set for a few minutes. The average working time is less than five minutes, with the longest times occurring in cooler temperatures. The putty must be in firm contact with the original to create a clear impression. Leave openings large enough to remove your original from, and also large enough to allow you to fill the mold with your molding material. Make sure any air around your original will be able to escape when you press your putty against the original master. If you will be using a liquid material for casting, you must make sure the opening is on top of your mold and the sides are level around the opening. You will need to leave the mold to set without it falling away from the original. Silicon does not stick to other materials so a mold release is not necessary, the putty may stick to fibres. Note: Copyright prohibits copies of work which is not your original. You must work quickly to make an accurate cast with silicone mold putty, and avoid re arranging the material once it is in place. It will begin to set in as little as three minutes after mixing, depending on the temperature. It is best to leave a thickness of 1/4 inch of putty on all sides of the mold. If necessary, thin areas can be backed with additional putty after the first layer dries, silicon will adhere to itself when freshly set and clean. Until you get used to the amounts you will need for molds, prepare one or two small extra masters to create molds for in case you have extra material from your original cast. Mixed putty cannot be saved for future use. Leave the original to sit in the putty for at least 20 minutes after the putty has set, to ensure it is fully cured. Gentle heat or a warm environment will speed curing time. Press the putty into the deepest areas first, or press out from the centre, to avoid pulling the putty away from the original as you create the mold. If you didn't mix enough putty, don't panic! Make sure the first coat at least thinly covers the detail areas you want to copy. You can add backing material later. A wide variety of brands of putty are available with slightly different characteristics including firmness, strength, food safety and the maximum temperature the material will withstand. Similar colors may be similar materials, packaged by different middlemen. Prices vary as does the packaged amount, so check for the type of putty in the price and package size you want. In general, putties which create the best detailing are not available through big box craft stores. Check with jewelry suppliers, polymer clay or food decorator suppliers or online.